Beauty subscription boxes are a great way to sample a wide range of products and brands without breaking the bank. Plus it's like getting a birthday present every month - a mystery box full of beauty goodies - who doesn't want that showing up in your mailbox? Having just finished my annual subscription to Bellabox, I thought it was time to branch out a little and see what else is out there. I originally started with BB as it was the cheapest ($15 a month) but have been a little disappointed lately in the quality and range of products I was receiving. So I subscribed to Lust Have It for the month to see how it compares. Before I give my verdict, here's a quick rundown of the products I received in each box this month. This is just your average body lotion, nothing too exciting but it's always nice to have travel sized lotions. It doesn't have much of a scent but goes on smoothly. I am head over heels in love with this nail polish!!! I love Essie polish's and this is just the shade I've been looking for. It's a lot lighter than the picture - more like a light grey with a hint of lavender hues - perfect for any skin tone. This combo is amazing and I wish the tubes were a little bigger. Charged with tourmaline to revitalise the skin, this cleanser and creme will leave your skin feeling fresh, soft and hydrated. Who doesn't love Burt's Bees? No further explanation needed, this cuticle cream is great for your nails and even though I've received this in a box, there's no harm in stocking up such a great little product. 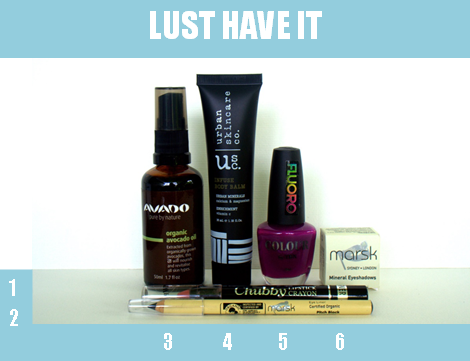 These were just tiny sample sized products, barely enough for one use. While I won't try the lip serum, the miracle creme looks nice. 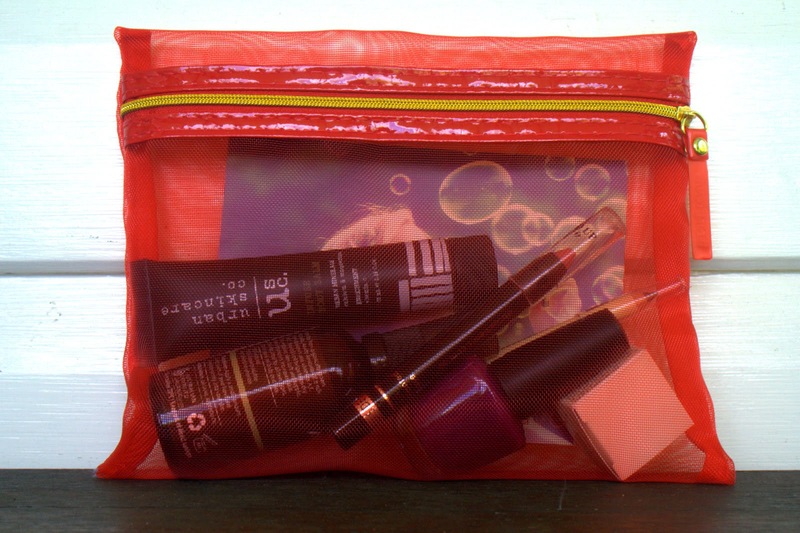 Again, another sample - I'm not too fond of sample packets but I suppose it's better than nothing. I can't say what this product is like as my mother claimed it as soon as I opened my BB. At least someone can enjoy it. 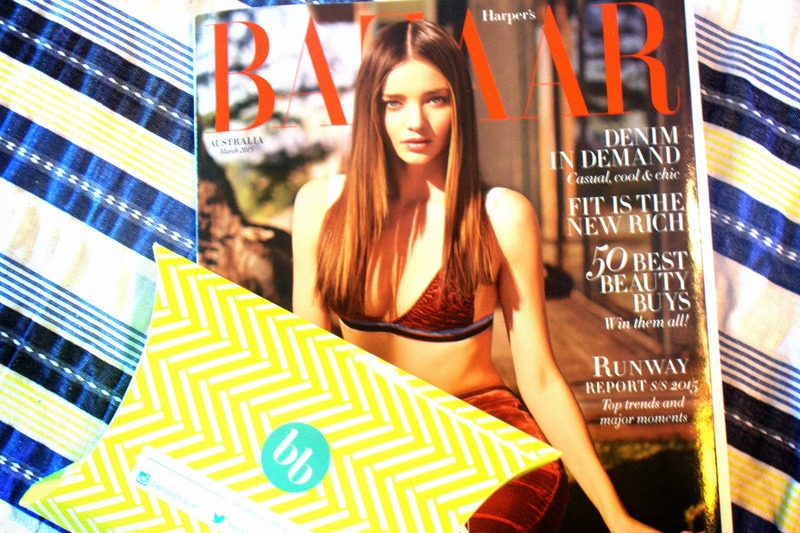 As if there wasn't enough in the box already, I received a copy of this months Bazaar which is a nice little bonus and I'm sure will be a great read. I've heard good things about these crayon's and so I was pretty excited to try this. I think it's a good product for the cheap price of $8 and it goes on so smoothly. It's a beautiful colour but doesn't suit my skin tone unfortunately so I may have to give this one away. I was so glad to see two Marsk products this month, being a more expensive and organic brand. This eyeliner does not disappoint! It glides on smoothly and is so easy to apply a neat, straight line. It doesn't have the best staying power although so you have to be careful not to smudge. I love any kind of oils so I was happy to see this in the bag, especially in full size. Oils are great for repairing and maintaining healthy skin so I can't wait to try this avocado oil and see the results. This body balm has the most glorious scent in the entire world. A mix of lemongrass and rosemary that stays on the skin for hours after use. I was sold purely on the smell but the balm itself is just as delightful. I'm pretty disappointed in the inclusion of this product. I'm not a huge fan of flouro, especially not purple. It's a $2.50 nail polish so it's a bit of a throw away item. This eye shadow is a bit shimmery for my taste but will be a nice subtle glimmer when used lightly. It has high pigment so a little will go a long way which is great as its quite a small pot. I was pleasantly surprised with both boxes this month. 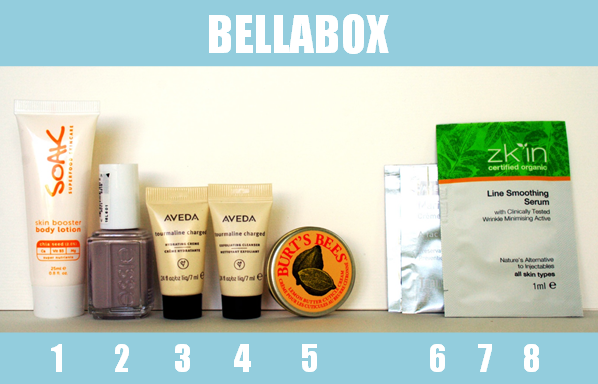 Bellabox really stepped it up this month which made it all the harder to judge. I think the Essie amd magazine won me over but without them, I think the box is lacking, especially having received so many lotions and cleansers from them in the past (they can be a bit repetitive). Lust Have It gave a great first impression! I was excited to see so many full sized products. I like to try new things and I feel the range of products was better - I'm definitely looking forward to trying their products more than BB's. 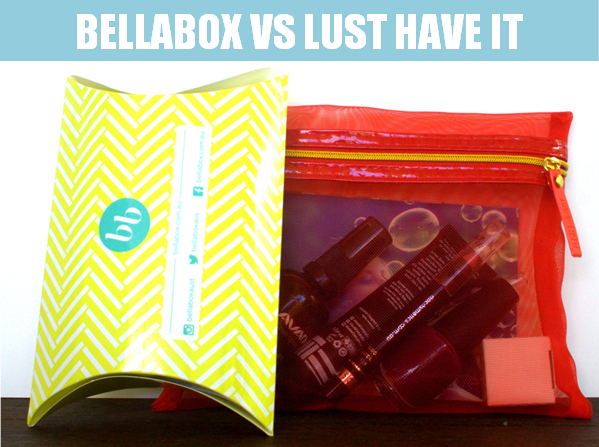 Both boxes more than cover their costs with Bellabox at $15 a month and Lust Have It at $20 a month. Taking in consideration price per mL, this month's BB is worth $66 and LHI comes in at $89. In regards to the quality and size of the products, I think LHI definately trumps BB. If you just want the cheaper option than Bellabox is for you but to me the clear winner is Lust Have It. With bigger and better quality products from a nicer selection of brands, forking out an extra $5 a month is totally worth it in my opinion.